1. How long have you been working with Pack’s Nursery? 2. What are your primary responsibilities? 3. What is the most rewarding part of your role? “One of the most rewarding parts is seeing the plants grow. It’s a long process – sometimes 15 years – but it is rewarding to see them out there and then know where they’re going. Our plants have gone on many college campuses and other unique places like a governor’s mansion in Arkansas or lifted to the top of a high rise apartment building in Dallas. 4. What do you think most people don’t know or assume incorrectly about your field? 5. What are the growing trends or areas in owning a nursery? 6. When you are not working, how do you spend your time? 7. Do you have a mentor who has played an integral role in helping shape your career? “My grandfather was a huge influence on me because I spent a good amount of time helping him when I was growing up. He really had a large impact on us all. Although he passed away 5 years ago, until two or three years before he died, he was the boss. We could tell him what we thought, but ultimately, what he said would go. 8. 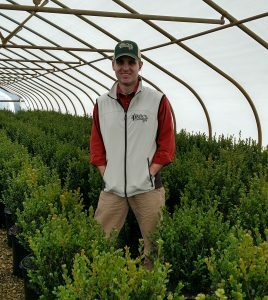 If there is one lesson you’ve learned after working in the horticulture industry for so long, what would it be? “To me, it’s very much a faith-based business. Looking to God is so much of what we do because none of our fields are irrigated – we rely on the Lord to do that. I remember growing up and going through droughts. My grandfather would say, ‘He’s taken care of us this far, He’ll keep providing.’ When you’re in a business that relies so much on mother nature, you must have faith that it’ll rain. 10. What is one characteristic every leader should possess? * Is there something most people don’t know about you?